The first bit of snow this winter has arrived – mostly a dusting, but some of it is sticking on tree branches. Of course that’s also indicative of the number of clouds floating around, making astronomy mostly an internet experience. So I find myself prowling around through others’ pictures and equipment, one thing I’ve noticed lately is that Takahashi and TEC scopes seem to get a lot of glory. That’s fine; I’m sure they have great products. Yet, at the same time, it seems like Televue isn’t getting it’s fair shake. Sure, they make great eyepieces. But they also make some great scopes! Case in point of course being the Televue NP101is! The “is” scopes were designed for imaging (“is” = “imaging system”). A giant 3 inch front to 2.4 inch focuser allows for large chip sizes to be used (Of course, I pair with my “APS sized” Orion Starshoot Pro, so I am amble to drop down to a standard 2 inch nosepiece, but it’s nice to know I could expand!) The focuser has a coarse adjustment and a fine adjustment yielding a 1:6 ratio between the two. This makes it really easy to get super finely tuned focus. You can find pictures taken with the NP101is throughout this site. With a field of view nearing four degrees, large targets, especially nebulous ones will spring to life! 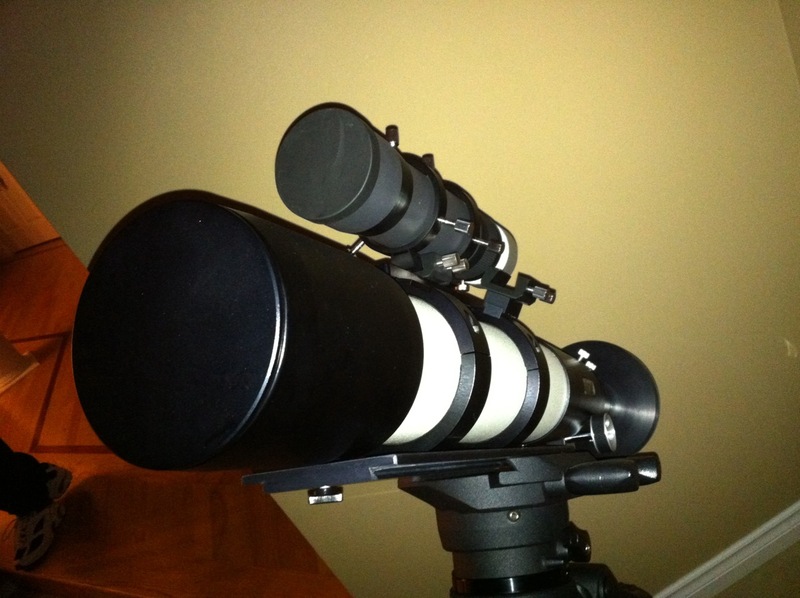 Another nice benefit of this scope is that it’s not particularly heavy. Coming in around 10 pounds, even the most timid of mounts will hold it. Of course, mine is on a CGEM with a 40 lb rating. This is one of those seemingly rare cases where the mount actually doesn’t have to cost more than the scope or camera! Now, I would love to tell you about how great the views are and pinpoint stars to the edge of the eyepiece, wonderful color correction, and all of that sort of stuff that you probably have read about most APOs. However, I’m not going to tell you that because I don’t have any idea. I don’t put eyepieces in this scope. I put cameras in it. And therefore you get to be the judge by looking at the aforementioned NP101is images I have posted up. With a fairly fast f/5.4 ratio on 540mm of focal length, great images don’t really take too long to grab! Sometimes I wonder if this scope is spoiling me because it just seems a little bit too easy. Lastly, I have not had any dew issues with this scope. There is a small retractible dew shield on the end of the scope. It slides in/out very easily despite feeling snug. I’m sort of surprised this little shield seems so effective. There are two areas I see for improvement. The first one is the 2.4 inch adapter stack. Since my camera is smaller, there isn’t a whole lot to gain here by maintaining a 2.4″ barrell up to my camera; a simple 2″ extender tube seems to work just fine. In fact, I really don’t like the whole 2.4″ play at all since virtually none of my existing equipment works with it. 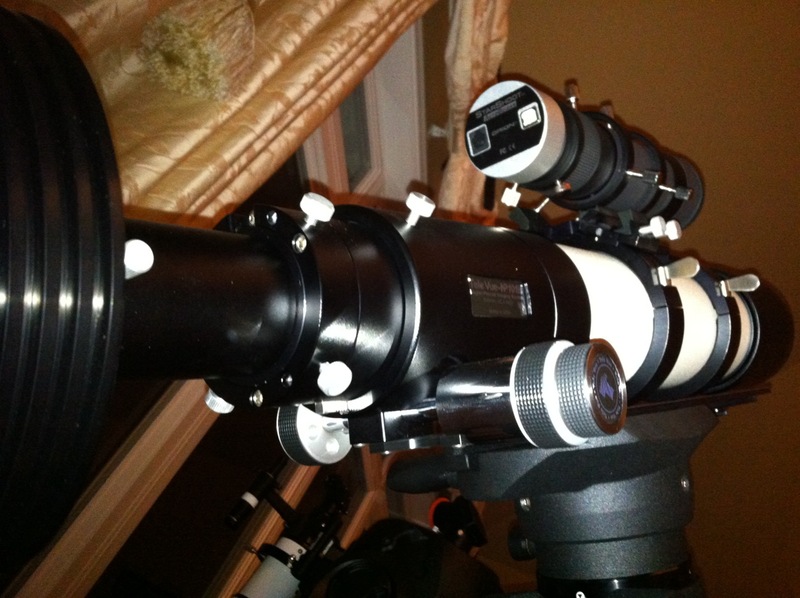 It’s nice to be abel to share equipment between scopes, and the 2.4″ makes this one the odd-man-out. I appreciate the requirement, but it would be nice if there were and easier way to put it together rather than a whole bunch of short adapters threaded together. The second is the case that the scope comes with. It’s well lined with nice foam and certainly protects the scope. However, the outside plastic shell seems a bit wanky to me. It’s not very rigid, and doesn’t seem to be very thick. It doesn’t close with the precision that I feel on the scope. It gives me the impression that while it would bend, it’d not be too hard to break. Ultimately, it just doesn’t fit the whole package sine the scope is out of this world high quality awesomeness… paired with an afterthought of a case. Go figure. 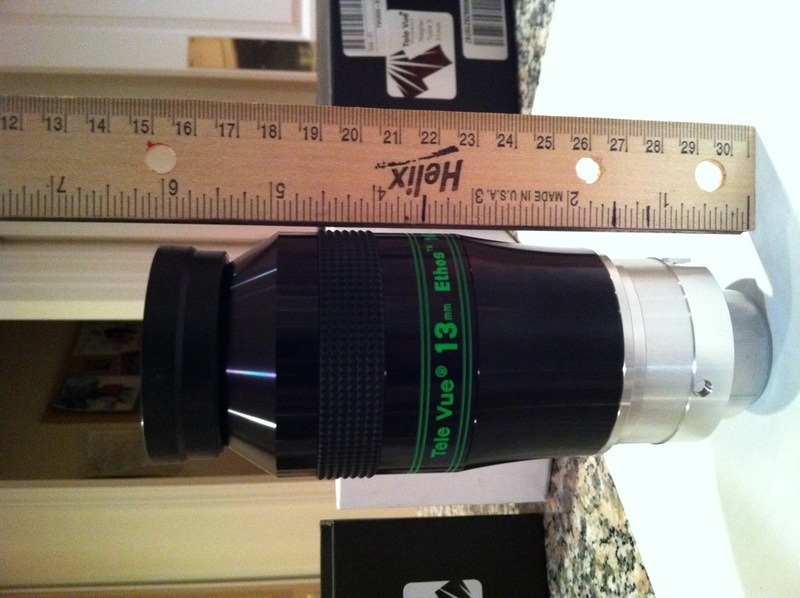 Televue seems to be most well known for their eyepieces, and I have collected a few of them. It’s not really any wonder why this had made them so popular — they are all brilliant and produce awesome scenes. The Ethos line were amongst the first to throw up an incredible 100 degree field. That means that for all practical purposes, you are not going to see the typical periscope like “black wall” edge of the eyepiece when you cram your face into these eyepieces. When you go to averted vision, you might think you are going to see it, but you’re not. This neat effect doesn’t come for free. These eyepieces are both expensive and huge! Huge might be an understatement… They’re bigger than the lens on my Canon Rebel XSI. Check out the length of these Ethos eyepieces coming in over six inches. Wow! Some of the older designs, in particular, the Nagler’s have a slightly smaller 82 degree field. This is still a huge view, but it is much easier to see the black zone. However, some of these eyepieces shrink down quite a bit in size and weight. Try to put a 13mm Ethos eyepiece into a single arm alt-az mount such as with the Celestron Nexstar 102SLT and the whole scope will drop under the massive weight of the eyepiece. The larger focal length CPC 1100 (a whopping 2800mm at f/10) really enjoys the larger 31mm and 21mm eyepieces and provides rewarding magnification. 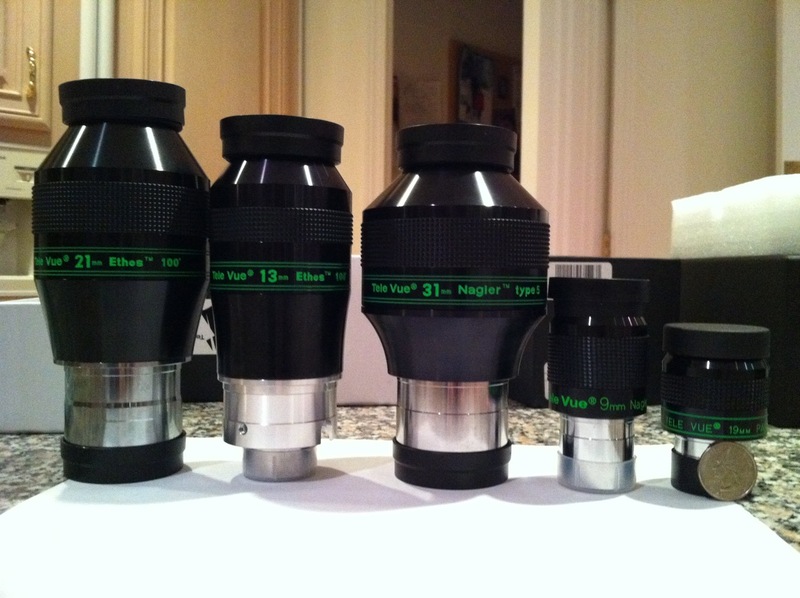 I couldn’t really image these eyepieces in smaller focal length scopes, but I am sure it would work well, especially for large FOV scopes! Here’s a comparison of their size and weight. Be sure to note the size of the quarter on the right side. In the table above, note that the weight is with the caps on, so the actual weight to yoru scope will be slightly less. If you are primarily a visual viewer, picking up some of these eyepieces won’t disappoint — but make sure that your scope won’t fall over when you put them in! Even that 31mm Nagler is a pretty hefty beast! This entry was posted by admin on November 21, 2010 at 5:04 pm, and is filed under Equipment. Follow any responses to this post through RSS 2.0.You can skip to the end and leave a response. Pinging is currently not allowed.